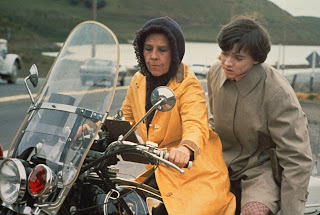 A dark romantic comedy about nothing less than death and its place in life, Harold And Maude is low-key, eccentric and always engaging. 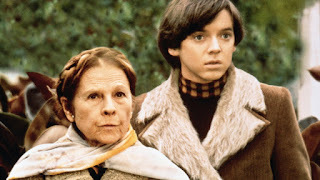 Harold (Bud Cort) is a young man suffocating under his domineering but very rich mother (Vivian Pickles). They live in a huge estate, and Harold mostly occupies himself with staging ever more elaborate mock suicides to try and get a reaction out of his mother. She is routinely dismissive. Harold's other past-time is attending the funerals of strangers, and he buys an old hearse to drive around in. Sessions with a psychiatrist don't appear to help. Harold spots the elderly Maude (Ruth Gordon) attending many of the same funeral services. She approaches him and they strike up an unusual friendship. A former radical protester for the cause of the day, the whimsical Maude loves art, music, and plants, but mostly appreciates life and lives it according to her own rules. She freely "borrows" the cars of others, disobeying all traffic rules, and relocates trees to help them grow. As Harold's mother arranges a series of dates to try and get him to settle down, he grows more attached to Maude, who is finally giving him something to love. Directed by Hal Ashby, Harold And Maude is a film with modest ambition and exceptional scope. Scenes of gruesome yet funny mock suicides alternate with the warmth of an unlikely friendship, and Ashby achieves a steady tone where dark humour, pathos, and the essence of being alive comfortably cohabitate. Essentially a two-person character study constructed with humour through a series of off-kilter encounters, the film charts the natural progression of a relationship between two unique individuals. Harold is a young man seemingly pining to die, Maude is an old but sprightly woman literally racing around in life, and in each other they find liberation. Maude gravitates towards teaching the morose Harold about the value of a life lived fully with principles that adhere to no rules and behaviours that respect no standards. She sets her own boundaries and joyously explains herself to anyone willing to listen, and in Harold she finds a willing student. Her guiding principle is the limited time available before death, and the need to enjoy every minute with no constraints. Harold finally finds a reason to start enjoying life once he gets to know Maude. Stifled to the point of emotional strangulation by his domineering mother, Harold is dead in all but name until Maude comes into his life. She provides a reference point to how life can be lived, and he awakens to the joys of emotional independence and unrestricted love. Harold And Maude bravely goes where few films have gone before and since. An extrapolation of themes from The Graduate, Harold represents burnt out youth completely detached from the achievement of his parents, and Maude the strangely alluring older woman. Her attractiveness starts out as more intellectual than physical, and the love that develops between them is less a seduction than an education. The age difference carries greater shock value, and Ashby deploys the services of no less than a screen priest to articulate just how hideous their relationship must appear to greater society. Harold And Maude don't care. When nothing less than understanding what it means to be alive is at stake, jolting society out of its stuffy confines is a small price to pay.